Stomach upset is the second most common complaint I hear from tea drinkers after caffeine intolerance. The culprits? Caffeine and polyphenols. They cause indigestion by stimulating the production of gastric acid. Tea can also be a problem for those prone to heartburn and stomach ulcer. Heartburn results when gastric acids rise up and spill into the oesophagus causing irritation. Tea is not the only food that causes the stomach to produce acids. Beverages such as coffee, caffeine or carbonated beverages and alcohol have the same effect. Watch out for foods such as raw onions, garlic, black pepper, chili, vinegar, spicy foods, cloves, nutmeg and all fatty foods such as dairy. They, too, irritate the stomach. Avoid cooking food with fat or oil. Boil. Broil. Bake. Grill. Poach. Steam. Avoid frying. Avoid a large meal that completely fills the stomach. Eat slowly. Chew thoroughly. If you drink loose tea, brew it half-strength. Add not more than 2 to 3 grams of leaves per cup. Full-strength tea causes the stomach to secret more acid. Drink tea in between meals. Avoid drinking tea with a meal or half an hour afterwards. Avoid drinking tea with an empty stomach. Drink tea with some ginger. Some people have found it soothes the stomach. Add milk and sugar. A 1984 study found that milk and sugar reduce gastric acid production. If you add milk, try using soya milk. A recent study about tea with milk found that animal milk contains casein that binds to catechins (the stuff that contains most of the tea antioxidants), reducing their effectiveness. Soya milk contains lecithin that has a different molecular structure to casein, and so is unlikely to bind to tea catechins the way casein does. Try drinking a darker oolong tea (such as the Wuyi Rock tea) or an aged oolong or pu-erh tea. They tend to be gentler on the stomach. Alternatively, go herbal. As an aside, green tea and stomach gastric irritation is often explained differently by Chinese and Western experts because of cultural differences. 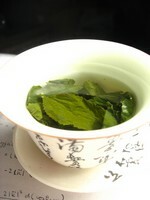 To a Chinese mind, the alkaline nature of tea conflicts with the acids produced by the stomach. When consumed wrongly by some individuals, it causes indigestion. It is about BALANCE. To a Western mind, tea beverages stimulate the production of gastric acid, leading to indigestion for some individuals. It is about CAUSE and EFFECT. They may be talking about the same thing: the alkaline nature of tea dilutes the acids in our stomach, causing it to secret more acid, but with different mindsets.